It’s everywhere, and it’s getting worse. In the last couple of days, really since last week’s worth of Primaries, Caucuses, and debates on both the Red and Blue sides of the aisle, the extreme hate rhetoric has heated up. Some might suggest it’s reaching the boiling point. I suspect that won’t actually happen until we’re much closer to June because people are still denying that a Trump or Cruz presidency is possible, or that a Clinton or Sanders presidency is possible (depending on your particular brand of wishful thinking). On my Facebook feed three distinctly different pieces of evidence have popped up that seem to be focusing the hate and ratcheting up the nastiness. The First Amendment, the right to free speech and free assembly, doesn’t belong to specified groups, and yet that’s what this country has become – a nation of echo chambers unable to bear even silent witness to the hatred and vitriol. I’d call them all parts of the problem, mainly because of the responses each is getting. First, closest to home, there’s the Fairfax, Virginia mom who reported on her FB wall some hideous information about her son’s classmates. Shaun King’s post on FB was sufficient to stir up horrified comments from friends on my own wall, recognizing how racist adult opinions affected the third graders in this child’s class, but the briefly visible additional vitriol spewed on the mom’s post, claiming it was a lie because it couldn’t happen here or, amazingly, that it was somehow justified. That Shaun King’s own post by nature was wrong because he’s not black. And that’s just the tamer stuff. The mom was smart to change the post back to private, if only to protect herself and her son. These days you can’t be too careful. Second, there’s Lauren Underwood, the college student who attended a Trump rally and her experience there. (The original FB post is still visible here: https://www.facebook.com/TurnUpTheBass/posts/10206924362926071?fref=nf&pnref=story.) Her treatment, and that of another silent witness, tell everything you need to know about Trump’s not so silent supporters. The Southern Poverty Law Center (SPLC) has a “Hate Map” on its site. If you check out the locations of those groups, you’ll see an unmistakable correlation with the GOP. These things should come as no surprise. Sadly, there are people who will reject this information because they believe the SPLC are themselves a Hate Group. It’s so easy to project these things onto others today. Just witness the tone-deaf “All Lives Matter” counter-movement to see what I mean. 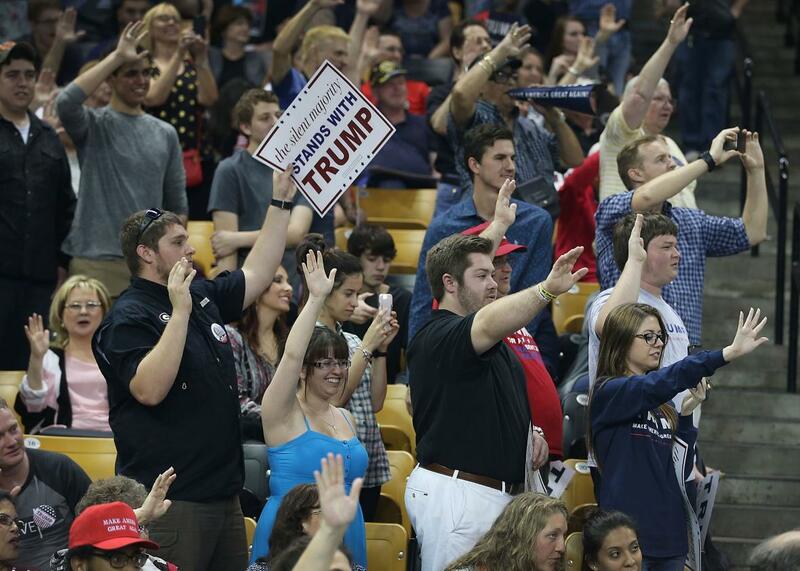 Then, finally, there’s this image, that’s circulating in connection to Slate’s article on a different Trump rally, in Orlando, Florida, land of the happiest place on Earth. The other two stories are anecdotal. We can only see through the eyes of the women who experienced the pain, but this? This is visceral. I’ve seen it before. So have you, if you’ve been paying attention. It’s no longer funny to call a halt to a conversation about politics by pulling Godwin’s Law. Even Godwin himself says the law no longer applies. The Silent Majority stands with Trump. Silent. The people who are coming out of the woodwork to vote this year in the Primaries and Caucuses belong, in some part, to these people, many of whom haven’t voted in decades. Because this election is for all the marbles and they know it. Not only that, but they’re so solid, so SURE that the Democrats can’t pull this one out, they’re voting in droves to guarantee it. Members of the media are dismissing the effects of this year’s primary votes. All the reports talk about percentages and wins. The numbers? They don’t lie. I’ve been watching the Primary and Caucus numbers as they’ve rolled in. Adjusted the spreadsheet to include the type of contest. As of last night two states so far (Maine and Nebraska) have had sufficient issues they’re still not certified as 100% on AP’s list of 100% votes counted. Today’s events in Hawaii (Closed Caucus), Idaho (Closed Primary), Michigan and Mississippi (both Open Primaries) will take us closer to the main party conventions. Based on everything I’ve seen, numbers are way up since 2008 (the last major administration change) and virtually all of the contests have seen an increase in Red voters and a decrease in Blue (though not everywhere). The numbers will become MUCH clearer at the end of March, when over half of the states will have had at least part of their votes counted. 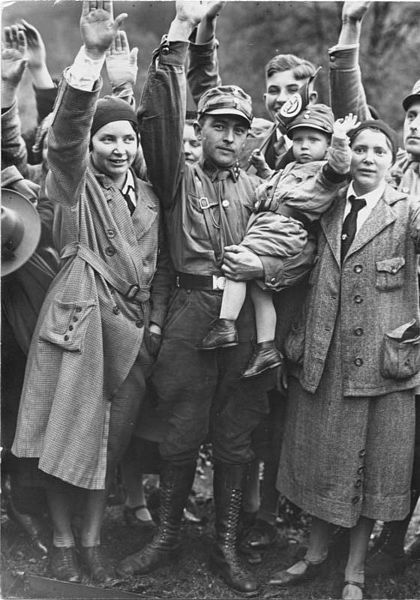 With the disaffection of the Green party and Independent voters because of their high principles, the “Anyone but Hillary” movement is building momentum, driven by the GOTP and their “Swiftboating” tactics, general confusion about the massive differences between Bernie Sanders’ Democratic socialism, Marxism-Leninism (commonly referred to as Communism) and the National Socialist German Workers’ Party (Nazis), the Silent Majority are dead sure they’re going to win it all this year, and they may well be right. And if Trump loses, the even more silent Christian Dominionists will win. To be clear, Cruz is no better. In fact, in a lot of ways, he’s much, much worse. And that, friends, is what has me terrified. Bernie’s response has finally sparked the conversation I’ve been expecting since he got into the race as a secular Jew. He’s getting it from both sides as a result. Reading the comments, those who think he’s not Jewish enough are questioning his faith and ability, and those who think he’s too Jewish are dismissing his views at the same time they’re dismissing his heritage. Those in the latter category also include Holocaust deniers, well-known for their white supremacist views, and McCarthy-style declarations, it’s quite possible that everyone will be fair game after January, 2017. If you’re still “anyone but ___” after reading this post, you’re still not clear on the concept. This might be the last election, if the GOP wins. You have the ability to keep them out of the White House. Share the hell out of any post (including this one) that lays bare history and the reality of the Holocaust. Learn from history or be doomed to repeat it.